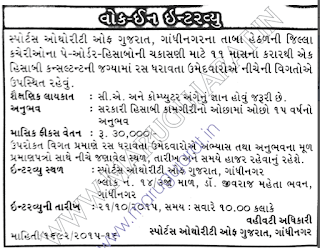 Sports Authority of Gujarat has published a Advertisement for below mentioned Posts 2015. Check below for more details. Educational Qualification : C.A. and Computer Knowledge. Salary : Rs. 30000/- per month. 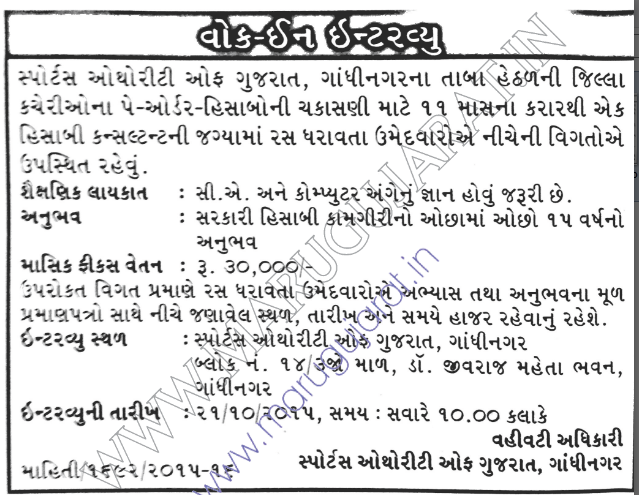 Venue : Sports Authority of Gujarat, Block no. 14, 3rd Floor, Dr. Jivraj Mehta Bhavan,Gandhinagar. Walk-in-Interview : 21-10-2015 at 10:00 a.m.